Tins are available in Solid color, Litho (printed), or Specialty. Browse our Tins page to see our large selection. For refill, bring empty tin to our store. Note: For Specialty Flavors (e.g. Caramel w/ Peanuts, Chocolate Drizzled, etc. ), please call for pricing. One gallon tins will contain one flavor of your choice. 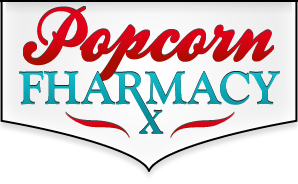 You can fill a 3½ gallon can with one, two or three choices of popcorn flavors. Use the chart below to determine the prices for your choice. You can fill a 6½ gallon can with one, two or three choices of popcorn flavors. Use the chart below to determine the prices for your choice.